The Global Ocean Commission, a new, high-level international effort to try to stave off eco-disaster in the world’s oceans, is being launched tomorrow in London, U.K.. Headed by former UK foreign secretary, David Miliband, former South African finance minister Trevor Manuel, and José María Figueres, a former president of Costa Rica, the Commission will promote international efforts to ensure the effective governance of international waters, and agreements governing such activities as deep sea fishing, pirate fishing, sea-floor mining and geo-engineering, all considered to be potential threats to the long-term viability of ocean ecosystems. Miliband is quoted as saying that “We are living as if there are three or four planets instead of one, and you can’t get away with that.” Actually, the ecological footprint of the USA, as one example, is much closer to ten “global hectares per person” than three or four. (Each global hectare encompasses the average annual productivity of all biologically productive land and ocean areas in the world). The world’s biocapacity—the amount of resources its ecosystems can supply each year—is only equivalent to about 2 global hectares per person, a value that is declining each year as population increases (see Mexico’s ecological footprint compared to that of other countries). 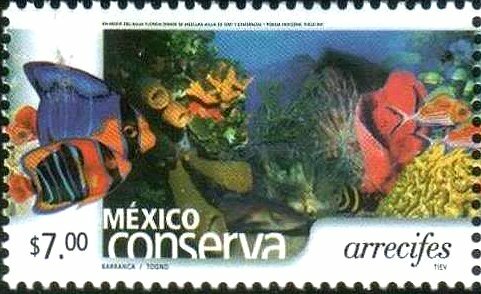 Mexico is one of the six most biodiverse countries in the world. While it has taken many steps to protect its marine resources, by enacting legistlaiton establishing fishing restrictions and protected areas, much remains to be done. Mexico’s coral reefs are particularly vulnerable. For example, the Cancún Marine Park is one of the most visited stretches of water in the world with over 750,000 visitors each year, placing immense pressure on its resources. We described one unusual conservation effort related to this area in “Artificial reef near Cancún doubles as an underwater art gallery” [Mar 2012] which looked at the work of Artist Jason deCaires Taylor, who created an underwater sculpture park, the Underwater Art Museum (Museo Subaquatico de Arte, MUSA), near Cancún. The museum, begun in 2009, currently consists of more than 450 permanent life-size sculptures set in the waters surrounding Cancún, Isla Mujeres and Punta Nizuc. Taylor is adding sixty additional underwater sculptures to the park, many of them modeled after local residents. This underwater museum is both attractive and functional, providing new habitat for coral and other marine life, as well as diverting snorkelers and divers away from fragile coral reefs, allowing them more chance to recover from the impacts of overuse. A documentary entitled “Angel Azul“ (see teaser above) is being made about Taylor’s work. It looks at the fragile state of Yucatán’s coral reefs and examines the importance of the “artistic journey” of Taylor and the important role that artificial coral reefs can have on the local environment.